A UK baking blog featuring cakes, cupcakes, cookies, desserts & more! Recipes included, sugar rush guaranteed! This Chocolate Chip Cookie Dough Fudge is smooth, creamy and melts in your mouth with the wonderful flavour of cookie dough. It’s also a great no-fail, no sugar thermometer fudge. What’s not to love? Don’t you just love it when you find a no-fail recipe for fudge? Not just any kind of fudge but chocolate chip cookie dough fudge? What’s not to love? No sugar thermometers! No wondering whether your sugar thermometer is inaccurate because the probe touches the bottom of the pan which is obviously hotter, so you stand there holding the darn thing ‘just’ above. And then there’s the times that you just can’t be bothered to bust out the sugar thermometer altogether. I mean, why bother when you discover no-fail recipes that don’t call for sugar thermometers, but the end result is perfect melt-in-the-mouth, creamy, and delicious chocolate chip cookie dough fudge? I also subbed out the milk chocolate chips for dark chocolate chips, but that’s my personal preference. But feel free to use vanilla extract and milk chocolate chips in your own version. A fun idea for Valentine’s Day fudge would be to use some pink or red gel food colouring to tint your fudge, then use mini heart cutters. Be sure to refrigerate until firm before cutting though. No-fail, no sugar thermometer smooth, creamy and melt-in-the-mouth chocolate chip cookie dough fudge. What’s not to love? Line an 8x8-inch baking pan with parchment paper or buttered aluminium foil leaving a 1-inch overhang. For the cookie dough, combine butter and sugars in a large bowl. Beat on medium speed until light and fluffy, about 2-3 minutes. Mix in the vanilla, salt, and half-and-half. Add flour and mix until incorporated. To prepare the fudge base, combine brown sugar, butter, salt and half-and-half in a saucepan. Stir over medium-low heat until butter is melted and brown sugar is dissolved. Remove from heat. Slowly stir in icing (confectioners’) sugar, 1 cup (150g) at a time, until mixture is smooth and sugar is incorporated. Stir in vanilla. Add the cookie dough mixture and stir to incorporate. At this point, the mixture should have cooled to room temperature; if not, continue stirring until it’s no longer warm to the touch. Fold in chocolate chips and spread fudge into the prepared pan. Chill until set, at least 3 hours. Cut into 1-inch squares and serve. Refrigerated fudge will keep for up to 1 week. For UK users, half-and-half is half (single) cream and half full-fat (whole) milk. Or alternatively, just use full fat milk; it won't be as creamy tasty, but will do in a pinch. I generally don’t like fudge but you had me at cookie dough! Can’t wait to try it!!! Um, yes please! I already know I’d be an uncontrollable glutton around these bad boys, Lisa. Cookie dough is my LIFE. Oh fudge. How I love it! And cookie dough? Sounds perfect and looks gorgeous! This fudge sounds gorgeous Lisa,Love the cookie dough. Would you mind if I used this recipe on my blog – with appropriate link backs of course? That fudge is seriously inventive. Really nice. Who doesn’t love cookie dough? OMG Lisa – these look amazing!! I sooooooooooo wanna grab one to two and eat right now!!!! ergqeprguergqepouiwfoh!~!!!!! That’s all I have to say to that…amazing. Can’t wait to try. Thanks for sharing! Oh my goodness! Headed over here from your comment on my Turkish Delight Cupcakes post, and I think I just developed a crush on you after reading this! Just checked off all the ingredients in my head – guess what I’m making tomorrow!!! Yessss. I don’t have a candy thermometer and you know I looooooove cookie dough anything! You had me at fudge and cookie dough! Two of my favorites in one glorious fudge! Your pics are amazing!!! I can’t wait to try and make some of this! Oh my goodness… these look absolutely amazing! honestly – does it get any better than chocolate chip cookie dough and fudge? I guess it does when you merge them together. I’d be thrilled if you’d link up at this week’s Off the Hook! I do not like cooking any fudge that requires a thermometer so I love this! Please tell me if there is substitute for vanilla bean paste? Otherwise I severly ready to make this FAB recipe! Wonderful! Wonderful! Can’t every go wrong with Cookie Dough! Thanks for sharing at Two Cup Tuesday at Pint Sized Baker . I hope to see you again there tomorrow night! Oh Lisa! I’m pretty sure this would be pure heaven in my mouth 🙂 Pinned and featuring tonight! Thanks so much for sharing! I think your substitutions are perfect! I prefer dark chocolate over milk almost always, and isn´t vanilla paste a great thing? I love it. Beautiful pics of a gorgeous fudge Lisa! Love this! I’d like to invite you to link up to Saturday Spotlight @ Angels Homestead. Hi what about the flour? Doesn’t it need to be cooked? Never Miss Another Recipe Again! SUBSCRIBE to receive new sugar-fueled new posts and recipe updates delivered direct to your inbox. 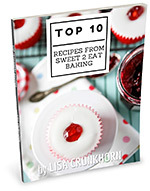 Plus, a FREE copy of my Top 10 Dessert Recipes From Sweet 2 Eat Baking eBook, as a thank you. You're almost there! Check your email and click the confirmation link to finish the process.